The United States Centers for Disease Control and Prevention (CDC) has reported in the 2012 National Immunization Survey (NIS) that the majority of children, age 19-35 months, remained extremely high from 2008 through 2012, although there was a small, but statistically significant drop in uptake of some vaccines from 2011 to 2012. In addition, the CDC specified a substantial concern about clusters of unvaccinated children in widespread communities that are at risk from vaccine preventable diseases, and may pose a health risk to the community at large. The study results were based upon a survey (cell and land-line phone calls with follow-up details from the health care provider) of about 16,000 children (an extremely large sampling for a survey). The data was then adjusted for racial/ethnic, income, and other population factors. Even though the CDC provided data from 2008-2012, the current method of polling was started in 2011, and only results from 2011 and 2012 are mathematically comparable. DTaP (for diphtheria, tetanus and pertussis)–by 35 months, a child in the US should have 4 doses of the vaccine. About 83% have had all four doses, and about 94% have had 3 doses. Despite several epidemics of pertussis (whooping cough) in a number of states during 2011 and 2012, it’s surprising that there is a slight drop in the number of children who have received either 3 or 4 DTaP immunizations. As I discussed recently, not getting the full series of DTaP vaccination increases a child’s risk of contracting whooping cough by 2200%. Yes, 2200%. Polio–vaccination for this serious disease remains high, but there was a small, but significant, drop in vaccine uptake in this vulnerable age group from 94% to 93%. Given the dangers of a polio infection, and that it hasn’t been completely eradicated throughout the world, it’s surprising that parents wouldn’t vaccinate their children for this disease. The herd effect level for polio is somewhere around 80-86%, so those who refuse to vaccinate can hide behind the parents who do vaccinate. But any further drops will shatter that illusory protection. MMR (measles, mumps and rubella)–this critical vaccine had a small but statistically insignificant drop in rates to around 92% uptake. Hib (Haemophilus influenzae type b)–Hib was a relatively common diseases 30 years ago, which can lead to a serious form of meningitis. Most infants, around 93%, have received the primary series of vaccinations, but only about 81% have received the full series. HepB (hepatitis B)–although the number of babies that are vaccinated at or near birth is relatively low at 71.6%, it was still a large and significant increase from 2011 to 2012. Additionally, around 90% of children have received their complete 3 doses by month 36. Varicella (chickenpox)–the vaccination rate for this potentially serious disease remains flat at around 90%. However, this disease is highly contagious and can cause long-term chronic diseases such as shingles. PCV (pneumococcal disease)–the vaccine uptake remains relatively high at more than 92% of young children are immunized against this dangerous disease. HepA (hepatitis A)–both 1 and 2 doses levels remain somewhat low at 81.5% and 53.0%, respectively, although it has shown slow year to year growth in uptake. Rotavirus-the uptake for this relatively new vaccine remains low at around 69%, although it has increased substantially over the past four years. This virus attacks the gastrointestinal tract of infants and young children, and it can lead to dehydration and other severe complications. The rotavirus vaccines has saved a lot of lives of children in the US and throughout the world. Combined series of vaccines (4:3:1:3:3:1:4 series, referred to as routine, includes ≥4 doses of DTaP, ≥3 doses of poliovirus vaccine, ≥1 doses of measles vaccine, full series of Hib [3 or 4 doses, depending on product], ≥3 doses of HepB, ≥1 doses of varicella vaccine, and ≥4 doses of PCV)–essentially, this group represents children who have been “fully vaccinated” against the major vaccine preventable diseases. The number is flat at around 68.4% of children, which could be indicative of some parents delaying some vaccinations, economic issues, and other socioeconomic situations, but it probably doesn’t indicate any massive refusal to vaccinate. 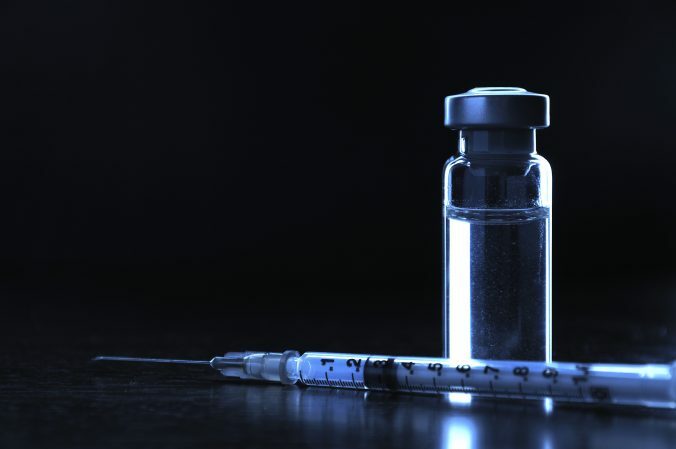 Children who received no vaccinations–a minuscule 0.8%. Despite all of the blather from vaccine deniers, only a tiny, less than 1%, number of parents completely refuse to vaccinate their children. And despite the huge number that do vaccinate, equivalent to billions of doses of vaccines, it’s kind of ironic that there’s not a massive number of so-called “vaccine injuries” out there. The analysis by state doesn’t show any remarkable differences by state, although HepB vaccinations at birth seem to be low in California, New York, Florida and Colorado. MMR vaccinations, which are necessary for measles, also show a relatively low uptake in a few states. This data is similar to CDC data on vaccination rates among kindergarten students in the USA (which was derived through different methodologies). High vaccination coverage among preschool-aged children has resulted in historically low levels of most vaccine-preventable diseases in the United States (1). The results of the 2012 NIS indicate that vaccination coverage among young children remained relatively stable and the proportion of children who do not receive any vaccinations has remained low. Slight decreases in coverage for some vaccines relative to 2011 cannot be immediately explained but could be attributable to a change in NIS methods. The 2012 results should be considered a baseline against which future trends in coverage can be evaluated. 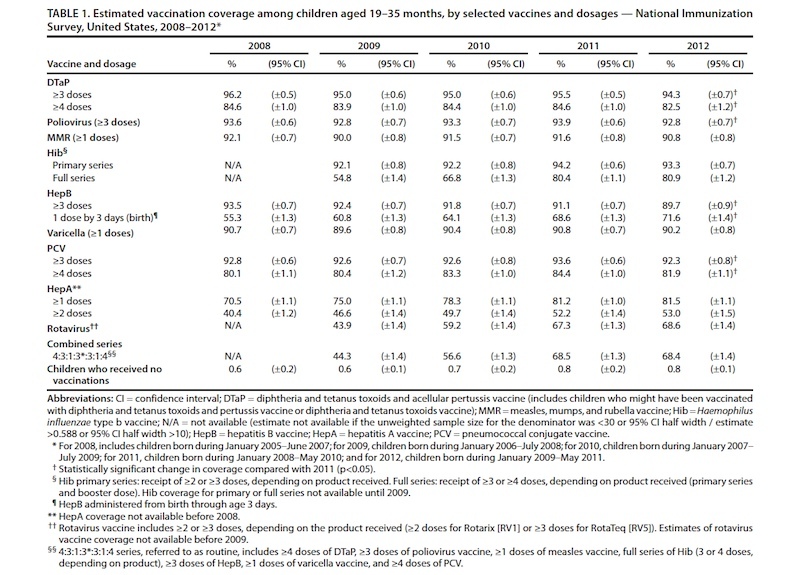 Immunization of U.S. children aged 19-35 months remains very high, with uptake of many routine vaccines (MMR and DTaP) continuing to remain near or above 90 percent, according to this 2012 National Immunization Survey. However, the study did uncover low vaccination rates for measles in some states (notably New York, Texas, Washington and West Virginia) are a concern to the CDC, and measles continues to cause outbreaks in communities with susceptible children and adults. Today, the CDC also reported a higher than normal number of measles cases so far this year in the United States and described recent outbreaks of the disease. All of the measles cases reported in the United States in 2013 are considered to be associated with importations from other countries, and most U.S. residents who got measles this year were unvaccinated due to philosophical objections to vaccination. Let me repeat something that I’ve said before. The antivaccine crowd really hasn’t had much of an effect if you take the broad population view of the USA. They are tiny, infinitesimally small, ignorant group of people, and have not swayed the discussion about vaccines all that much. However, in many areas, there are pockets of unvaccinated children which lead to outbreaks of whooping cough, measles, and other vaccine preventable diseases in the USA. Moreover, even if only 0.8% of American children are not vaccinated (and based on previous research, about 20-30% of those who are not vaccinated are because of legitimate medical exemptions), that’s thousands of children will be exposed to long-forgotten vaccine preventable diseases. Every time one of us pro-science bloggers convince someone to vaccinate their children, we might save a life. We need to do as much as we can save more lives, because that’s what immunizations do. If you need to search for accurate information and evidence about vaccines try the Science-based Vaccine Search Engine. Centers for Disease Control and Prevention (CDC). 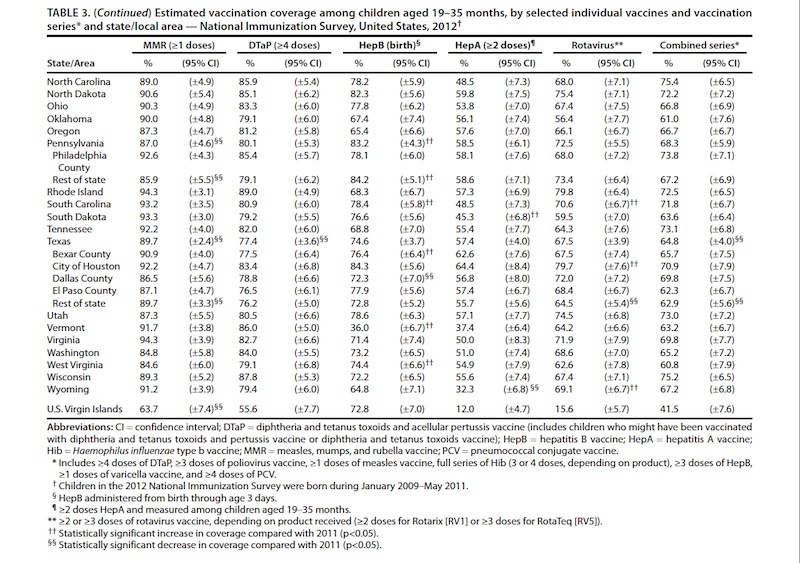 Vaccination coverage among children in kindergarten – United States, 2012-13 school year. MMWR Morb Mortal Wkly Rep. 2013 Aug 2;62(30):607-12. PubMed PMID: 23903595. Centers for Disease Control and Prevention (CDC). 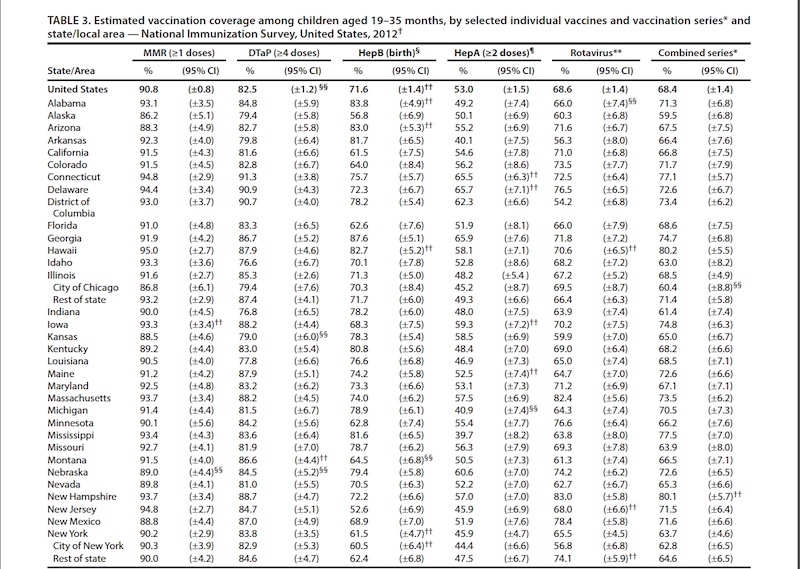 National, State, and Local Area Vaccination Coverage Among Children Aged 19–35 Months — United States, 2012. MMWR Morb Mortal Wkly Rep. 2013 Sep 13;62(36):733-740. Centers for Disease Control and Prevention (CDC). Measles — United States, January 1–August 24, 2013. MMWR Morb Mortal Wkly Rep. 2013 Sep 13;62(36):741-743.